A while ago on harp-l, there was mention of some diatonic bass harmonicas that had recently turned up on eBay. I've been fortunate enough to obtain a sample for review and I have to say that I am quite impressed. However, I will start with the bad news (sort of) that it is not really a true bass, but more in the baritone/tenor range. The blurb for these instruments in the eBay auctions stated that the lowest note was EE - ie the same as the lowest note of a standard Hohner bass. Actually, the lowest note is one octave higher than that, the same as the lowest note of a standard guitar, or the E below the lowest note of a low C chromatic or diatonic. Despite that, it is still a very useful instrument. It is made in China by the by company that makes the Golden Cup harmonicas, but it is of much higher construction quality than the majority of the cheap Chinese harps familiar to most of you. It measures about 7 1/2" long and 1 1/2" front to back (about 19mm by 3.8mm). The comb is black plastic (ABS, I think) and the covers seem to be chrome plated brass. Overall, the harp feels quite substantial and no sharp edges or corners. It has a single reedplate 1.19mm thick, secured to the comb with 12 screws and the front of the comb overlaps the front edge of reedplate, so there is no brass exposed to the player's mouth. It has a strong rich tone, the reeds are very well adjusted and the tuning is also pretty good - equal temperament at about A=442Hz. It comes in a nice plastic case with a cleaning cloth. It is strictly diatonic, covering two and a half octaves of the C major scale from E to A. This sounds quite limited when compared with the usual chromatic bass harmonicas, but it could be surprisingly useful. Certain blues riffs lie well on the instrument, particularly in 3rd, 4th and 5th positions, where you could thicken up a "Hoochie Coochie Man" type riff much more than you could with a typical diatonic harp. Of course, it is also useful for playing in C major, as well as major pentatonic stuff in 2nd and 12th positions. As I said in my earlier post, it is what is termed a "Single Harmonica", which is a very popular type in Asia, often used for music education. The Single harmonicas have the notes arranged in groups that cover a diatonic octave, with a separate chamber for each individual reed. Usually these groups begin with a B and end with an A, with a slightly thicker divider before the start of the next octave. In the case of the of the Leo Shi bass, the first hole is a blow E, the second a draw F, the third a blow G and the fourth a draw A. Then there is a spacer, followed by B draw, C blow, D draw, E blow, F draw, G blow, A draw. Another spacer, then another full octave B to A. This layout layout wouldn't be too alien to anyone familiar with the typical chromatic harmonica or the middle octave of the diatonic, although it may take a while to adjust to the wider spacing of the holes and the fact that each hole contains a single reed, rather than blow reeds and draw reeds sharing the same hole. Perhaps it wouldn't be all that useful for a bass player in a traditional harmonica trio, but I think it could be an excellent addition to the arsenal of a diatonic harp player looking for some new sounds. Since writing the above, more Leo Shi instruments have found their way across to the Western Hemisphere. In addition to the key of C instrument reviewed above, the Leo Shi Bass is now available in the keys of A and E. Except for some very minor differences (different cases and slightly different cover bolts) they are exactly the same as the C version - apart from their pitch, or course. My only disappointment is that they chose to make them higher in pitch than the C version, rather than lower. Alternatively, it would have been nice to have given them the same range as the C harp, but starting on another step of the scale. For example, where the C version has the blow notes E, G, C, etc., it would have been nice to have had an A version with the blow notes E, A, C#, etc. and an E version with the notes E, G#, B, etc. However, this would have required different combs to be made for each key, which I assume was not economically feasible. Anyway, although their pitch range does make them less suitable as true bass instruments, it does make them very nice for playing lower range melody lines. The key of A instrument starts on a C# one octave lower than that found in hole 2 of a standard diatonic and the E instrument starts on a G# two octaves lower than hole 2 of a standard E diatonic. This would make them ideal for filling the role of a cello, or a baritone sax in an ensemble. 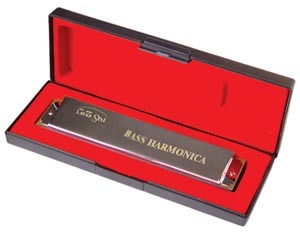 In addition to the diatonic basses, the Leo Shi Bass 2 Harmonica has recently become available. This is essentially two of the diatonic instruments joined together, the lower one in the key of C (identical to the C instrument reviewed above), the upper one in the key of C#. This enables the player to play completely chromatic lines by alternating between the upper and lower deck, in much the same manner as the traditional Hohner-style bass - however the Leo Shi version is much more manageable (weighing in at slightly less than 11 ounces, or 300g) and has both blow and draw reeds. The traditional Hohner-style bass is all-blow, although it does have a deeper range than the Leo Shi (and costs ten times the price!). The traditional Hohner-style bass also has pairs of reeds tuned in octaves, but personally I have always preferred the clear single reed sound, such as you get with the Tombo Contrabass or these Leo Shi instruments. The hinges at each end allow the angle of the two decks to be adjusted to suit the player's preferences and the instrument comes in a very substantial and very attractive looking wooden case with heavy brass fittings. I think this would be great for any harp players wanting to branch out into playing different types of harmonicas, as well as being a nice addition to the tonal palette of players of the traditional Hohner-style bass. Apparently Leo Shi also make a couple of different models of compact chord harmonica. Hopefully we will get to see these imported into the West before too long. 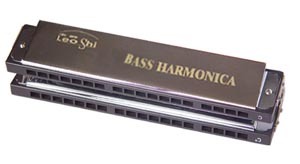 Leo Shi harmonicas no longer appear on the manufacturer's website, so presumably they are no longer in production.